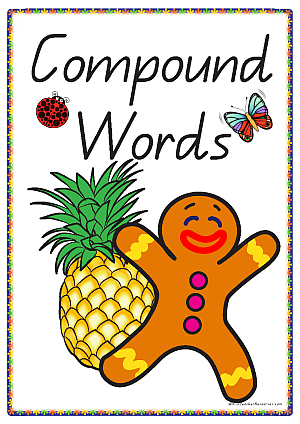 Compound Words – 178 Cards – Ideal to cut up as puzzles – mix and match and play literacy games – learning about compound words. Print out cards (print smaller if you like) use one set for classification games such as classify by ‘double letters’ etc – loads of ideas from ‘101 Word Card Activities‘. Cut the other set down the middle using either a straight cut or zigzag puzzle cut – children match the 2 pieces. Use the puzzle pieces above to make up ‘silly compound words’ – for example – jellyglasses, bedbox, earberg, ladysaver. Children draw funny pictures to match..
As a class, in groups or individually – brainstorm and add new compound words (great homework activity). Go for a ‘word walk’ and find more in environmental print and books. Using the cut up pieces above – play ‘concentration’ – turn them all over – children take turns turning over 2 pieces – try to find the matching pairs. Make smaller black and white copies easily by printing 3 or more to a page – ideal for children to cut up and paste the matching pairs.